Welcome to the Online Corbett Park Jeep Safari Booking service. Visitors can make online booking of the seats in Jeep safari and Canter safari by using the online booking service provided here. All the procedures of Ranthambore Safari booking for Jeeps and Canters are fully administered and managed by the forest officials of the Corbett National Park. The Corbett tiger reserve area is divided into the 06 Safari zones or routes, and the safari tour is organized in all the zones. 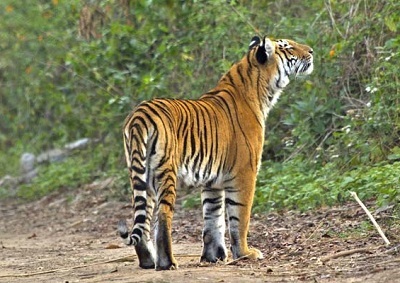 The Corbett Tiger Safari booking service is available for all the zones of the park. However, the safari zones are allotted randomly to the Jeeps and Canters by the forest officials using a computerized allotment system just before the entry into the Jim Corbett National Park. Explore the richness of Mother Nature at Jim Corbett National Park with Corbett Tourism jungle safari in Jim Corbett and discover what makes this little gem a paradise for photographers, adventure seekers and wildlife lovers. A safari tour is the best way to face some fiery faces (tiger, jackal, wild boar and Himalayan bear) of the park. You can rejoice three types of safaris available in Jim Corbett National Park; Jeep Safari, Elephant Safari and Canter Safari. Among all these safaris, jeep and elephant safaris are the most common ones and are available for every zone of the park. But Canter safaris only available in Dhikala Zone, the core area of the national park. It should be noticed that only those people can do jeep safari at Dhikala zone having permits to stay at the forest lodges situated at Dhikala zone. If your plan is to stay outside Dhikala zone then canter safari is the only option to do safari at Dhikala zone. Because of topography and enormity of wilderness, safari timing in Corbett are mainly limited to sunshine period of the day only. The park basically opens at 6’o’ clock in morning and remains open till 11’o’ clock in morning while in the afternoon the park’s opening timing is 1430 to 1730. The timings are variable as per the season. So it is the best practice to get the entire information from the forest officials, while visiting the park. 1. Jeep Safari at Jim Corbett National Park is possible in Morning and Evening Time Only. 2. Morning Time: 6:30 Am to 9:30 Am and Evening Time: 2:30 Pm to 5:30 Pm. or Timing Might be Little Bit change because of Weather Condition & Season. 5. Jeep safari will book in advance basis. Booking starts 45 days prior to your tour date. 7. Visitors Will Be Responsible for own Luggage in Safari ( Gypsy living ) Timing or If you loss any thing in safari ( Gypsy living ) timing we are not Responsible. 8. As per jungle safari regulations, once confirmed and booked, the booking amount of Jeep Safari is Non-refundable, Non-repalceable and non transferable.